The world's only meal replacement protein that aids in ketone production! Get all of the facts about our innovative Keal Meal here! Keto Meal is the world’s first and only meal replacement that aids in ketone production. It’s groundbreaking science packed into a delicious meal replacement. Keto Meal was designed specifically to optimize keto, low carb, and paleo lifestyles. It’s now available in a great tasting, natural chocolate, and vanilla flavors. Keto Meal is a complete and instant ketogenic meal. It contains all the necessary macronutrients, micronutrients, vitamins, electrolytes and minerals for a complete keto meal, in a convenient, easy to mix powder. Consumers experience suppressed appetites, controlled sugar cravings, increased energy during workouts, and even flatter stomachs. *Keto Meal was engineered using Acacia fiber/MCT, which has been shown to be an effective pre-biotic. This helps to reduce glucose levels, improve gut health, and promote appetite suppression and weight loss. When should I take Keto Meal? We recommend for you to enjoy your Keto Meal replacement for lunch. However, since Keto Meal is a meal replacement, you can substitute Keto Meal out for any meal! Where should I store Keto Meal? It is recommended to store in a cool, dark area away from moisture. Why is there Whey Protein in Keto Meal? We use whey protein in our Keto Meal because of its countless health benefits. Whey protein is linked to health benefits including immune system support, preserving lean body tissue, and helping your body maintain healthy blood pressure levels. Whey protein also contains leucine, glutathione and conjugated linoleic acid, which promote weight loss and muscle gain. Click here to see our references to the benefits of whey protein! What makes Keto Meal different from the other keto meal replacements? Only the patented formula in Keto Meal uses MCT and BHB to burn your own body fat for fuel while simultaneously fighting cravings and satisfying hunger. How much BHB & MCT is in one serving of Keto Meal? We have a proprietary blend of 12 grams of BHB Quad Salts and MCT formulated to deliver what we believe is the equivalent of 15gm of just BHB salts. Does Keto Meal contain milk? Yes, Keto Meal contains Milk Casein . We are also happy to report that we are constantly evolving and improving the product and are currently exploring a dairy-free option! What do you use to sweeten Keto Meal? We use the non-bitter portion of the stevia leaf to sweeten Keto Meal (and PRIME), which reads on the ingredients listed on the back as rebaudioside A. Will Keto Meal put you in Ketosis? Can I Take both PRIME & Keto Meal within the same day? 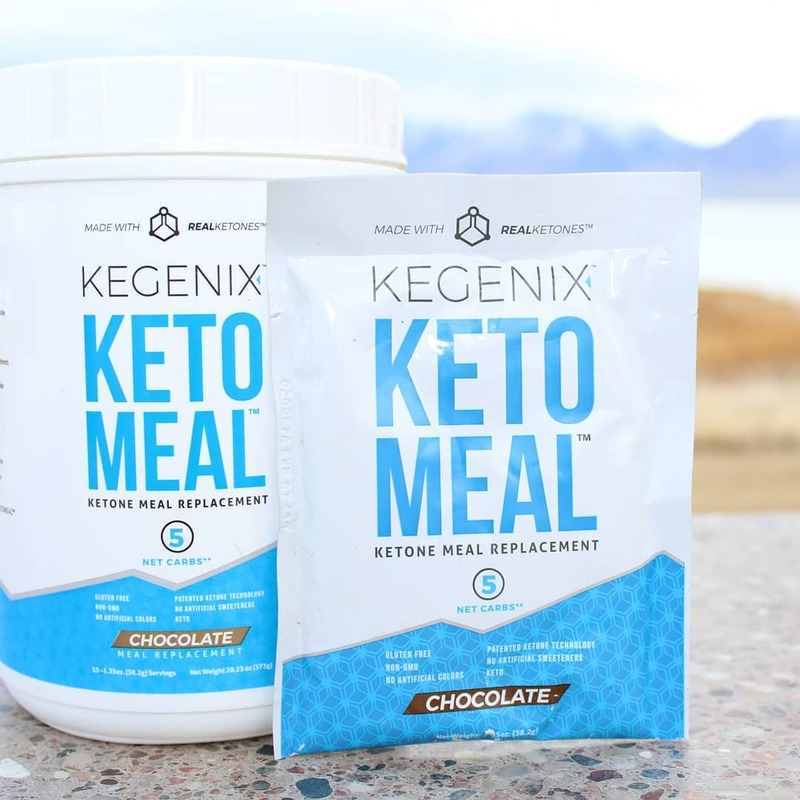 Keto Meal Replacement is the perfect complement to Kegenix™ PRIME ketosis powder in helping to elevate and sustain ketone levels for optimal health and energy. We suggest you take Kegenix PRIME ketosis powder in the morning and Keto Meal replacement in the afternoon. Can I substitute my protein shake for Keto Meal? Yes, Keto Meal provides 10g of protein with every serving! Whats the difference between Keto Meal & PRIME? PRIME is engineered to put someone in ketosis in 30 to 60 minutes. PRIME is our ketone supplement that can be used for all kinds of purposes that elevating ketone levels can be used. KETOMEAL is engineered using real ketones provide people a complete meal replacement including the protein, fat, ketones, fiber and vitamin/minerals in a Keto balanced ratio. Can I mix Keto Meal with other substances other than water? YES! Keto Meal is very versatile- we've created recipes for some of our favorite combinations and published them to our website! Below are some of our most popular, but feel free to explore and create some of your own! Chocolate PB Green Banana Smoothie 🍌- A smoothie you'll go absolutely BANANAS over.. get it? Quit monkeying around & get to blending up our variation of this classic combination! Caramel-Mocha Shake using Keto Meal 🍫-Our Keto-licious take on a Caramel-Mocha Shake! Almond Elation Shake 😀- We would call it Almond Joy, but this mix takes it up a notch! You butter make enough for two- you'll want seconds of this cinn-ful treat! Click here to order now while supplies last!